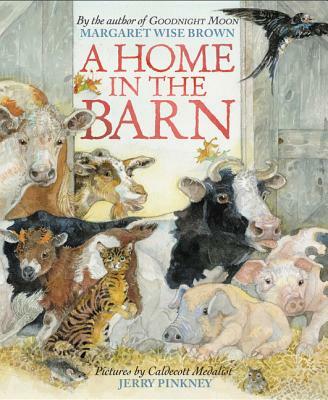 Perfect for fans of Goodnight Moon, The Runaway Bunny, and Big Red Barn, this never-before-published picture book from beloved children’s book author Margaret Wise Brown tells the comforting, snowy story of animals seeking shelter from the cold in a big warm barn. Brought to beautiful life by Caldecott Medalist and multiple award-winner Jerry Pinkney, this is a must-have for every child’s library and is perfect for cozy wintertime readings. Jerry Pinkney is one of America’s most admired children’s book illustrators. He has won the Caldecott Medal and five Caldecott Honors, five Coretta Scott King Awards, the Coretta Scott King–Virginia Hamilton Award for Lifetime Achievement, the Laura Ingalls Wilder Award, the Society of Illustrators’ Original Art Show Lifetime Achievement Award, and many other prizes and honors. Jerry Pinkney lives with his wife, author Gloria Jean Pinkney, in Westchester County, New York. You can visit him online at www.jerrypinkneystudio.com. "I grew up in a small house in Philadelphia, Pennsylvania. I was a middle child of six. I started drawing as far back as I can remember, at the age of four or five. My brothers drew, and I guess in a way I was mimicking them. I found I enjoyed the act of putting marks on paper. It gave me a way of creating my own space and quiet time, as well as a way of expressing myself. You can imagine six children competing for attention and to be heard. I would sit, watching and drawing. "In first grade I had the opportunity to draw a large picture of a fire engine on the blackboard. I was complimented and encouraged to draw more. The attention felt good, and I wanted more. I was not a terrific reader or adept speller in my growing-up years, and I felt insecure in those areas. Drawing helped me build my self-esteem and feel good about myself, and, with hard work, I graduated from elementary school with honors. "I attended an all-black elementary school, and I gained a strong sense of self and an appreciation of my own culture there. But Roosevelt Junior High was integrated. There I had many friends, both white and black, at a time when there was little mixing socially in school. There the spark for my curiosity about people was lit. You can see this interest and fascination with people of different cultures throughout my work. "My formal art training started at Dobbins Vocational High School, and upon graduation I received a scholarship to the Philadelphia Museum College of Art. My major was advertising and design. The most exciting classes for me were drawing, painting, and printmaking. It is no wonder I turned to illustrating and designing books. For me the book represents the ultimate in graphics: first, as a designer, considering space, page size, number of pages, and type size; then, as an illustrator, dealing with the aesthetics of line, color, and form. "There were three books that somehow magically came into my possession in the early sixties: The Wind in the Willows, illustrated by Arthur Rackham; The Wonder Clock, illustrated by Howard Pyle; and Rain Makes Applesauce, illustrated by Marvin Bileck. You can see those influences in my art today. Later, my work was greatly influenced by such African American artists as Charles White, Romare Bearden, and Jacob Lawrence. "From the very beginning of my career in illustrating books, research has been important. I do as much as possible on a given subject, so that I live the experience and have a vision of the people and places. To capture a sense of realism for characters in my work, I use models that resemble the people I want to portray. My wife, Gloria Jean (also an author), and I keep a closetful of old clothes to dress up the models, and I have the models act out the story. Photos are taken to aid me in better understanding body language and facial expressions. Once I have that photo in front of me I have freedom, because the more you know, the more you can be inventive. "For illustrating stories about animals, I keep a large reference file of over a hundred books on nature and animals. The first step in envisioning a creature is for me to pretend to be that particular animal. I think about its size and the sounds it makes, how it moves (slowly or quickly), and where it lives. I try to capture the feeling of the creature, as well as its true-to-life characteristics. There are times when the stories call for the animals to be anthropomorphic, and I've used photographs of myself posing as the animal characters. "It still amazes me how much the projects I have illustrated have given back to me in terms of personal and artistic satisfaction. They have given me the opportunity to use my imagination, to draw, to paint, to travel through the voices of the characters in the stories, and, above all else, to touch children."